The EPSON ColorWorks C7500 Series has some new and unique features that will that will speed the take up and serious use of digital desktop full colour label printers. There is the C7500G model ideally suited to gloss labels for that ‘supermarket look’ and there is the C7500 ‘standard’ model best for matt substrates and especially those qualified under British Standard (BS)5609 for GHS/CLP hazardous substance labelling and also outdoor label capability in all weathers. We are already focused and experienced with many C7500 G/C7500 installations, we look at some of the features in more detail…. Included on site breakdown warranty with print head warranty. This must be a first for a manufacturer to include an on-site warranty at no additional cost. 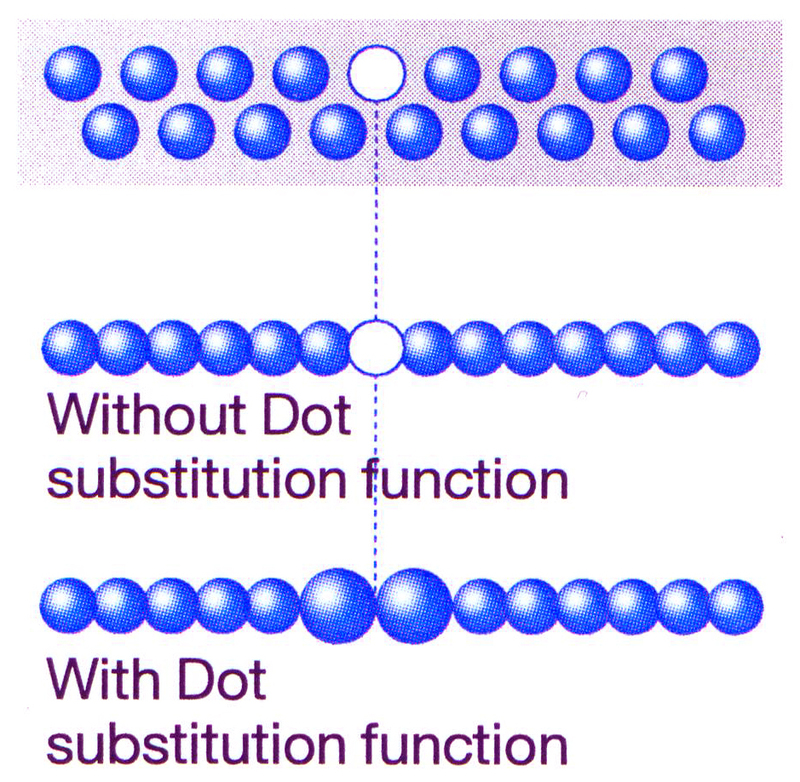 Implemented by EPSON engineers who are confident in their piezoelectric technology (used for years on their poster printers) they include a next day response to site call out service guarantee if there is any breakdown or print head problem and fix the problem on site and and any replacement print head is included too!! 300ml bulk ink tanks. The C7500 Series has perhaps the largest ink tanks in its class. By buying ink in bulk the cost of colour ink per printed label can be very low typically a fraction of a penny for a full colour 4 x 3 inch (102 x 76 mm) label for example. We find this can be an important feature of a colour label printer that attracts buyers to print their own labels in exact numbers just when needed. We have been replacing old thermal printers with full colour printers and finding the labels in colour are actually lower cost than a pre-printed labels with ribbon method and customer gets the ability to change the designs at will so no wasted pre-printed labels stock, indeed no stocks at all. One customer has released about 50% of his factory space by removing pre-printed label inventory using two of our colour label printers. High sustained print speed. The C7500 ColorWorks is super-fast and maintains its high print quality even at the fast speed of 300mm (12 inches per second) so your labels needed for each product or package can be printed in a very short time. High quality print. Many of our customer still have the old 300 dpi printers that can only print black and struggle these days to incorporate the extra detail needed on a labels like for ingredients, nutrition and instructions. 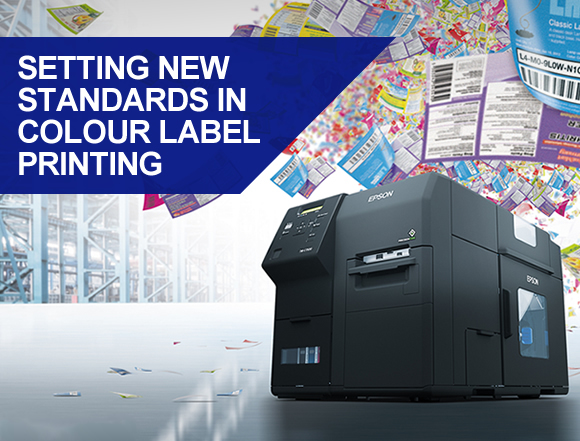 The C7500 ColorWorks Series with its 1200 dpi fine detailed print is especially useful for printing detailed ingredients and instructions labels moving from 300 dpi printing to high precision 1200 dpi imaging and with full colour adding logos, pictures and own branding as required. One of our sandwich and bakery customers is adding colour photographs of customer specific venues and winning new supply contracts showing the power and flexibility of own brand full colour label printing. Clip on roll winder. 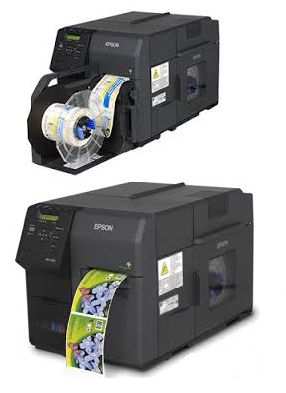 Epson include an option of a clip on winder driven from the printer itself, a neat solution if wanting to collect the printed labels to a roll for hand application. Zebra Emulation. 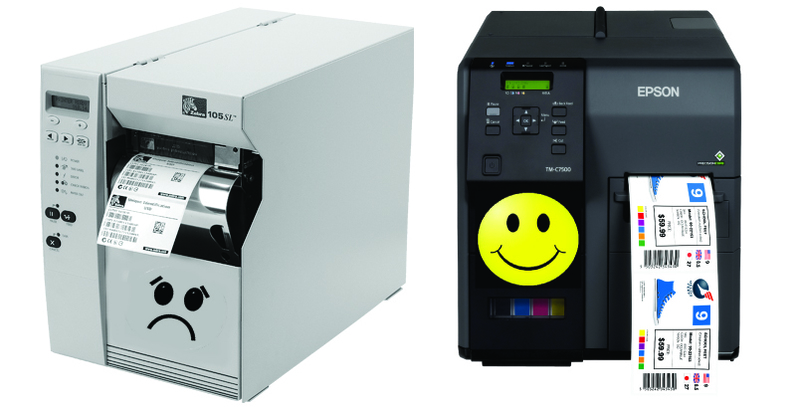 For users of Zebra thermal and transfer ribbon printers the C7500 ColorWorks series includes a Zebra printer emulation, so plug out your old mono label printer an plug in the new EPSON ColorWorks C7500 / C7500G. The C7500 ColorWorks Series can slip full colour backgrounds behind the normal Zebra print so eliminating the need to buy in part printed labels, you get full colour from low cost blanks! Further eliminate the use of ribbon, ribbon creasing, smudging and ribbon wastage and disposal problems.